In ancient times, the city of Ephesus, located on the Aegean coast in modern-day Turkey, was known as the site of one of the seven wonders of the world: the great temple of Artemis, mother-goddess and patron of the city. Every year, the residents of Ephesus paid her homage with an elaborate procession led by the city's civil leaders and magistrates. By honoring Artemis, the city ensured the favor of the goddess and its own continued prosperity. Prosperous, sophisticated, highly cultured, Ephesus was the leading city of the wealthy and populous Roman province of Asia, one of the most precious jewels in the empire's crown. Some of its wealthiest citizens lived in expensive condominiums known as the Houses on the Slopes. They have been carefully excavated by an Austrian archaeological team. The visitor who steps from the city's huge, open public spaces into the private intimacy of a living room occupied nearly 2,000 years ago also crosses over an invisible threshold of both space and time. Here are the living quarters, the atrium, the ovens, the bedrooms with their frescos and mosaics. One imagines that their inhabitants have just stepped out, perhaps to run an errand, but will shortly return and offer an invitation to dine. The wealth evident in both the private and public spaces of the city was generated, in part, by the activity of its harbor located beside the Kaystros River, close by the fertile Meander Valley. In the first and second centuries, generous stipends from the Emperor paid for dredging that removed silt and kept the harbor open to ships arriving from ports across the Empire. In the third century, when the imperial treasure could not always afford this expense, wealthy Ephesian citizens saw that the work continued. In the year 52 CE, one of those vessels may have carried a new visitor: the apostle Paul. His missionary efforts in the Greek city of Corinth having proven initially successful, Paul now planned to establish new communities in Ephesus. Rich, pampered, sophisticated, and pagan to the core, Ephesus must have appeared as the ultimate challenge. In a letter to the Corinthians, written from Ephesus, Paul exults: "a great and effectual opportunity has opened to me, but there are many adversaries." (1 Cor 16:9). While he was busy establishing new congregations, Paul learned that his Christian communities back in Corinth were in serious trouble. There were reports of rivalry, immoral behavior, confusion over belief and practice, as well as challenges to Paul's own apostolic authority. In the letter known as First Corinthians, Paul deals with these concerns in detail, but he also reminds his people of the message that lay at the heart of his teaching: love. Paul's words, which many scholars believe he penned during his long stay in Ephesus, have become emblematic of how many Christians define their faith. When Paul wrote these words from Ephesus, the city was still some years away from its golden era of culture and affluence. After a period of economic and political turbulence lasting throughout the third century and well into the fourth, Ephesus entered a new age of prosperity, this time in partnership with the Christian imperial government. 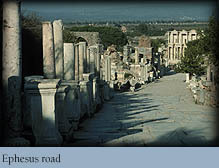 Today, the city of Ephesus stands as it did in ancient times. No modern city was ever built over it; once the emperor stopped the funds used to dredge the harbor, it gradually filled with silt and became unusable. Without the waterway, Ephesus lost its commercial value and its standing as a vital urban center. Today, the contemporary visitor can wander freely down the great marble streets, through the marketplaces, the forum, the temples, the smaller odeon, where the city council met, and the great theatre where plays were performed and where animal fights once entertained the crowds. It remains one of the most magnificent sites of the ancient world; no one who visits this place will ever forget it.